Christy Gast: ¿’Onde va la lancha? Time: 6pm for a 6.30pm start, finishing approximately at 8.30pm. Discipline, Ensayos, and Gertrude Contemporary are pleased to present ¿’Onde va la lancha? a performance by artist, Christy Gast. The evening will be convened by Camila Marambio. The performance is preceded by a lecture by Chilean art historian Carla Macchiavello entitled ‘We were always fueguinos’. ¿’Onde va la lancha? is a 25-minute lecture-performance by New York–based artist, Christy Gast. Gast provides a live voice-over for a video projection that was filmed in the fjords of Tierra del Fuego. We find ourselves inside an artisanal fishing boat during a storm, its creaking and rocking provides the rhythm for a song; the audience joins in. We are under water with a whale. The whale whispers, we learn its song. We are underwater collecting shellfish; we sing the forgotten song of the west wind. The lecture begins as a conventional artist’s talk, but as the camera dives below water the tone changes—the audience and the artist are immersed in the world of the fjord and must come to terms with its inhabitants, past and present. Image: Christy Gast, ¿’Onde va la lancha?, 2016. 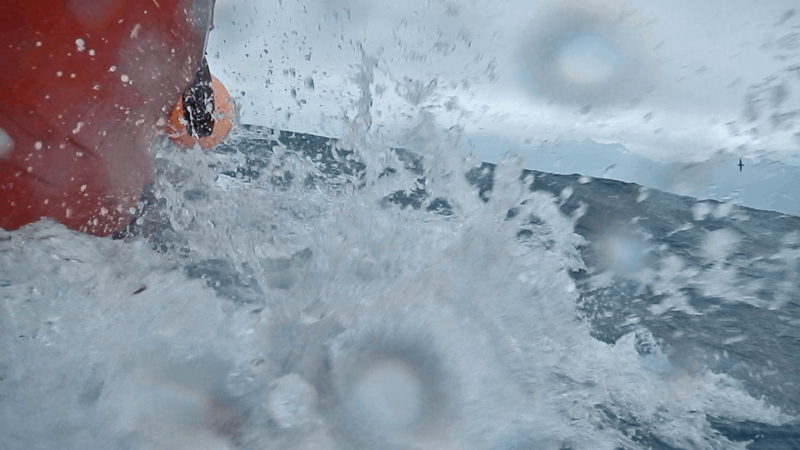 Video still (rough seas).